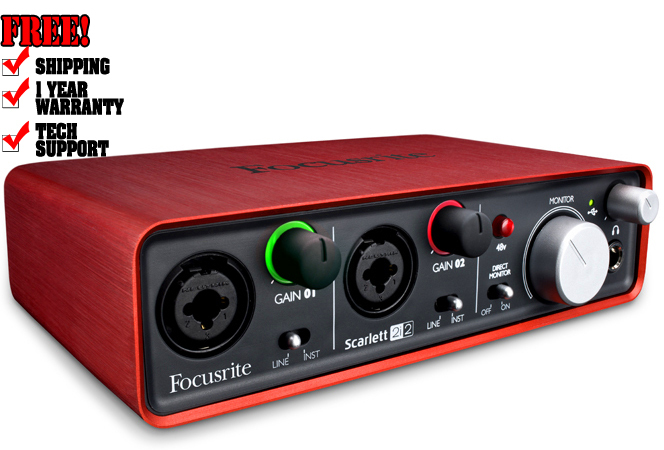 The Scarlett 2i2 is a 2 in / 2 out USB recording interface featuring two award-winning Focusrite preamps. Housed in an attractive anodised aluminium unibody chassis, the interface not only sounds fantastic but looks great too. What's more it's solid enough to take on the road when you travel. The Scarlett 2i2 is much more than just a pretty metal box. 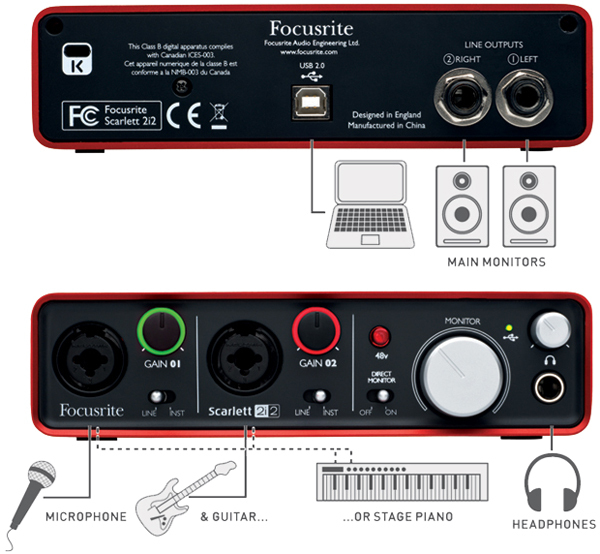 Scarlett 2i2 features two high quality award-winning Focusrite mic pres. With more than 25 years of experience in designing analogue equipment, Focusrite produce the best mic preamps in the industry. The preamps found in the Scarlett 2i2 are no exception to this, and share the same design as those found in our flagship interfaces: Saffire PRO 40 and Liquid Saffire 56. With 24-bit resolution at sample rates of up to 96 KHz, the digital conversion in the Scarlett 2i2 is of very high quality meaning that every note and every subtle detail is captured with great clarity. The anodised aluminium unibody chassis ensures that your Scarlett 2i2 can withstand the harsh environment of the road. It also makes Scarlett 2i2 the most beautiful interface around. Scarlett 2i2 is very light and compact making it easy to fit in a laptop bag. It's also bus powered meaning that you don't need an additional power supply. Simply plug in to your computer and hit record! Inside the box you'll find Ableton Live Lite 8, as well as Focusrite's Scarlett plug-in suite. Compatible with all major DAWs, Scarlett plug-in suite provides EQ, Compression, Gate and Reverb – essential tools for polishing your mix. Flick the direct monitor switch on the front panel of your 2i2 and you will hear what you're recording through your speakers or headphones, without the signal having to go through your computer. This avoids the possibility of latency, which can be distracting when recording. Scarlett 2i2 has been fully tested with Mac OSX 10.7, Lion. So you can rest assured that your brand new Mac and Scarlett 2i2 will run together perfectly! Height:45 mm / 1 ¾ "